The Seventh Heaven - a very impressive, versatile high gain distortion pedal. Goosoniqueworx is a small effects pedal manufacturer from Singapore. The Seventh Heaven is a high gain twin channel distortion pedal with a bit of a difference. Rather than using diodes to clip the signal the Seventh Heaven utilises cascaded JFETs to achieve high gain distortion very similar to a high gain valve amplifier. The Seventh Heaven employs a base distortion switch which triggers the pedal, and a boost switch which gives you more grit and fattens up the sound too. The boost only operates when the distortion is engaged. Within the base distortion settings there are two “channels’ which are accessible via a toggle switch. This gives you low gain, and high gain distortion options with slightly different tonality as well. Most distortion pedals have one tone dial, the Seventh Heaven has a 3 band tone control, with treble, mid, and bass provided, just like most amplifiers. Goosoniqueworxs have also added an interesting switch which goes between a presence setting, which people would be quite familiar with seeing on many valve amps, and a feedback setting. On the presence setting you will find a bit more of a brighter tone with added treble as you dial it up. Switching over to the feedback option will give more low end, and scoop the mids in a subtle way. The Seventh Heaven also has true-bypass switching to keep your signal nice and pure when not running the pedal. Batteries cannot be used with the Seventh Heaven, but it is capable of handling 9 through to 18 volt power supplies. A higher voltage power supply will give you increased headroom, but a less gain. I was recommended running 12 volts, and since I had a 12 volt power supply I tried it out. Plugging into the Seventh Heaven and setting the channel to the low gain green channel you will be greeted by lovely vintage crunch. Playing with the tone controls and the presence or feedback options you will find classic Vox and Marshall type tones. You can go from slightly overdriven to nice mid gain distortion with the boost engaged that will be suitable for most rock music. Hitting the boost will not only add a bit more gain, but it will fatten up the tone as well. Switching over to the high gain red channel – which happened to be my favourite – you will be greeted by light gain at the low end of the dial, through to some nice meaty chunky distortion, perfect for a lot of heavier rock, punk and metal. Engaging the boost switch once again fattens up the tone, and then piles on a huge amount of brutal metal tones. You can find a range of high gain Marshall and Mesa type tones that will satisfy any heavy music lover. The high gain channel really sings for lead work, with beautiful sustain, and best of all, very little noise for such high gain distortion. The beautiful thing about the Seventh Heaven is, that unlike many high gain distortion pedals this will not sound like a jar for of wasps. It is that big, fat, real high gain amp sound that so many pedals may promise, but always fall short on. If you are wanting to hit the Seventh Heaven with an external boost of some sort you will be pleased to know it loves being hit with dirt pedals. I tried both my custom TS-9 type overdrive and an MI Effects Crunch Box distortion to overdrive the already distorted Seventh Heaven, and I was great by beautiful tight higher levels of distortion in both cases. All of the tone shaping controls offer a wide range of tonal options which is fantastic. You can crank the mids and get that great biting tone, or scoop them and get massive percussive chunk. The Presence/Feedback controls are great for dialling in that sound in your head, and add a lot to an already feature laden pedal. The beautiful thing about the Seventh Heaven is that you can roll back the volume control on your guitar to clean things up. Even with the high gain channel engaged with the boost on you can roll back the volume, play lightly and get a fairly clean sound. Turn off the boost and you should find a decent clean that would satisfy most. I decided to try running the Seventh Heaven through the effects loop of my amp, using it as a preamp. Besides the lack high volume, as the pedal is not designed to be used as a preamp, the Seventh Heaven sounded amazing in this configuration. I would love to see Goosoniqueworx build a preamp version of the circuit, with a clean channel, seperate 3 band tone controls, and shared presence/feedback setting. It comes so close to sounding like a nice tube amp that many people who may not be able to afford a nice tube amp could use it with a reasonable solid state amplifier in the effects loop, or with a dedicated solid state power amp. No corners have been cut with building the Seventh Heaven. The switches and enclosure are nice and solid, and will stand up to getting stomped on for some time. Everything about the Seventh Heaven feels high quality, which is fantastic coming from such a small operation. Overall the Seventh Heaven is an amazing high gain distortion pedal, but don’t be turned off by the high gain part. 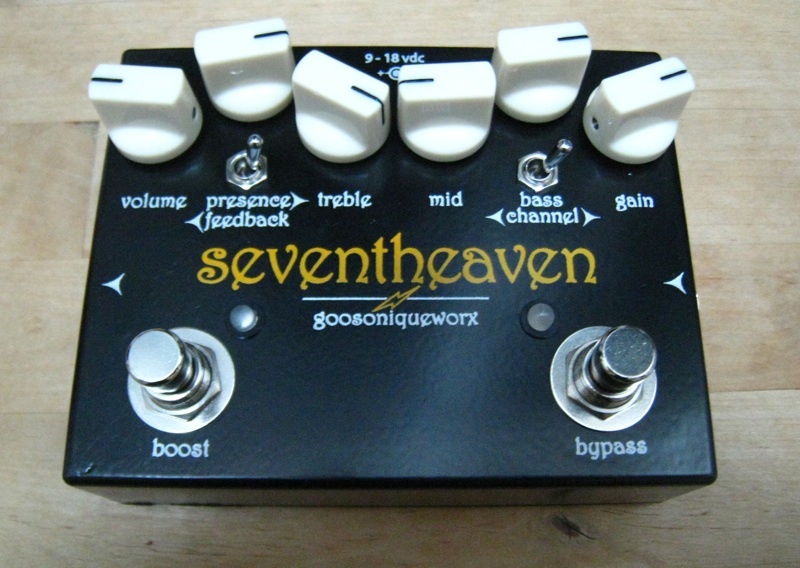 If you are looking for a nice low to mid-gain distortion the Seventh Heaven will cover all territories. It sounds fantastic all the way through it’s range, and is the perfect accompaniment for all guitar styles. Thanks to John from Goosoniqueworx for providing the Seventh Heaven for review. 2 Responses to "Goosoniqueworx Seventh Heaven distortion – review"
One friend of mine had the Seventh Heaven distortion pedal and I want to say that with the help of this pedal we could get the best sound needed for our songs… a great tool for every guitar player! Great review. Makes me more intrigued than ever to give it a shot. I was going to run a demo of this on my channel but, sadly, it never came to be. One day.. 🙂 Good stuff.